Bill Seibert, picture left, is one of the unsung heroes of our art club. A native of New York City he was introduced to oil painting as a teenager. He worked for Electric Boat Division of Groton, Conn., as a Nuclear Engineer designing and building Nuclear Submarines. He and his wife moved to SCW in 1994. This is when Bill started painting in earnest. He has been actively involved in club as Treasurer, Publisher of membership roster, Librarian, Maintenance technician of copy machine and 2003-2016 he facilitated Monday afternoon model sessions. Bill became Newsletter Editor in 2012 and he continues to do a superb job in this capacity. His medium is oils and Bill prefers to create still life and Trompe L’oiel paintings. This soft spoken and humble man deserves to be recognized as one of the outstanding pillars of our art club. We are fortunate to have him among our members. 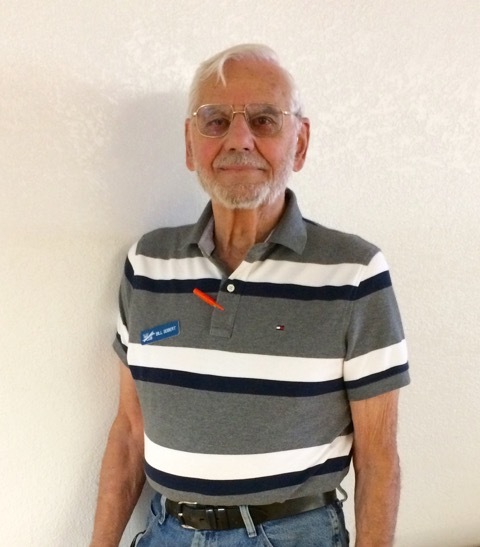 After spending 40 years as a computer and software engineer, Jim Boline moved to Sun City West in 1999. He was ready to relax and pursue his lifelong interest in art. Jim had always enjoyed sketching and when he joined Sun West Art Club began taking classes and getting involved in the club. He worked mainly in oils and watercolor and was fond of portraits doing many family and friends portraits over the yrs. He was the first president to serve two terms. Jim was elected treasurer in 2004-05. He also maintained data base for the yearly roster. His most recent assignment was as email coordinator which he performed for many years sending all club messages to members. At this time (2017) Jim is contemplating returning to Milwaukee to be near his son. Sun West Art Club salutes Jim for his many years of service to the club!